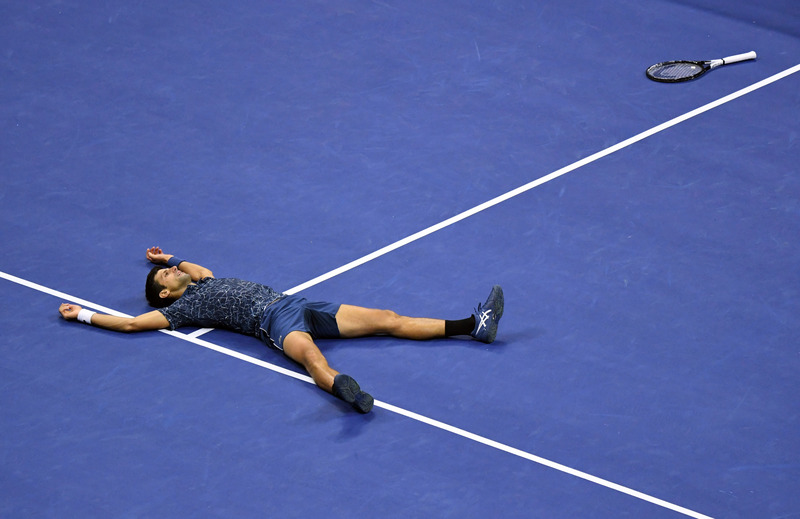 A clinical Novak Djokovic dismissed Juan Martin Del Potro 6-3 7-6(4) 6-3 to collect his third US Open title on Sunday, giving him 14 Grand Slams to move into a tie for third on the all-time list alongside Pete Sampras. A season that started gloomily with elbow surgery after the Australian Open is turning into a brilliant finish for the 31-year-old Serb who has now won three of his last four events including back-to-back majors at Wimbledon and Flushing Meadows. Over the last eight weeks Djokovic has resembled the Grand Slam machine that held all four major titles at the same time in 2016. "When I had the surgery of my elbow earlier this year I could truly understand what Juan Martin was going through,” Djokovic said at the trophy ceremony, referring to the Argentine's long battles with injury. “You learn from adversity ... when you have doubtful moments when things are not working out as you want (them) to." Playing on the same court where Pete Sampras claimed his 14th and final Grand Slam crown, Djokovic had endured more disappointment than joy on Arthur Ashe, mining just three titles from eight finals. "I was hoping he’s going to be here tonight but I want to say ‘Pete, I love you, you’re my idol,’" said the Serb. The disappointment on Sunday belonged to a teary Del Potro who was back in a Grand Slam final for the first time since the big Argentine won his one and only title at Flushing Meadows in 2009. Djokovic and Del Potro walked on Arthur Ashe Stadium court with the Billie Jean King National Tennis Center still buzzing over the controversial women's final on Saturday, won by Japan's Naomi Osaka after Serena Williams incurred three code violations. Britain's Alison Hughes, the second woman to umpire a US Open men's singles final, kept a low profile as the two former champions went to work. The tension and fireworks of the Osaka-Williams clash were left behind during a relatively calm and composed baseline battle between two friends and familiar foes who had played each other 18 times, with Djokovic holding a commanding 14-4 edge. Djokovic kept up the pressure with an early break in the second before Del Potro broke back to end the Serb's run of 23 consecutive holds. The tension lifted in a marathon eighth game that took 20 minutes to decide, Djokovic finally holding to keep the set on serve at 4-4. That seemed to take some of the fight out of the Argentine who went down 7-4 in the eventual tiebreak. A focused Djokovic continued to apply pressure in the third set until Del Potro finally cracked on serve to fall behind 5-3, with the Serb closing out the match with a ferocious overhead winner.